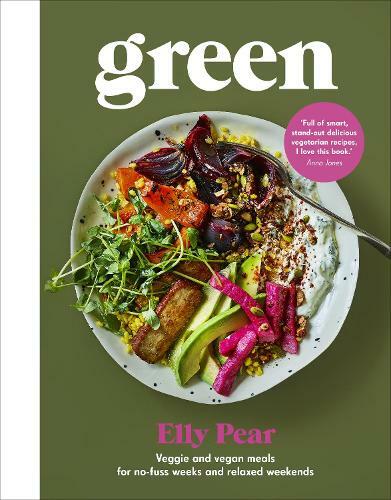 In GREEN, bestselling cookery author Elly Pear shows you how to easily vary veggie and vegan dishes to suit your fancy, with ingenious options to make a meal speedy and simple or a bit more special. For those wanting to eat more plant-focused meals, GREEN offers over 100 easy recipes developed for either weekdays or weekends, so you're covered for all days and occasions. The weekday recipes target speed and ease, and the weekend recipes are for when you have a bit more time and fancy something a bit special. Weekday offerings include freezable food, no-fuss traybakes and one-pot dishes for when you can't face washing up or hands-on cooking. A meal prep section will have you sorted for the week ahead. Plus a whole load of meals you can make in 20 minutes for those nights you need great food fast. A whole host of weekend recipes offer sumptuous brunches and seasonal suppers for family and friends. Tuck into: Harissa chickpeas with za'atar, and baked feta OR with gremolata on toast Peanut spicy slaw wraps Stir fried kimchi grains with fried egg Whipped feta on toast with roasted tomatoes, basil and savoury granola Rarebit baked baby potatoes with watercress Vegan BLAT sandwich with umami mayo Jalapeno brine French toast crumpets Whether you are already vegetarian or vegan, or just want to eat a bit less meat, GREEN serves up tasty, flexible fare, all of which is meat-free, and half is vegan.